Every blog is made differently, whether its your business blog or you just started it out for fun. Your blog should be your passion and you should put in every effort possible to keep it alive. Blogging by no means is a one time game, it’s for life! Starting a new blog is easy, but keeping it alive is not that easy. It takes a lot more than creating content to make it a success. What is the secret to running a successful blog? It’s a perfect combination of creating awesome content, promoting your content, passion to educate your readers, desire to learn and time management & productivity. The most effective way to learn, without a doubt is to learn from other industry leaders. They are your best mentors. Now, they wont be coming to you to teach you, but there are some great books written by them where they share their experiences, lessons, strategies they used and a lot more. So today I am going to put together a list of popular books (with great user ratings) that every aspiring blogger should read to make the most out of their blog. 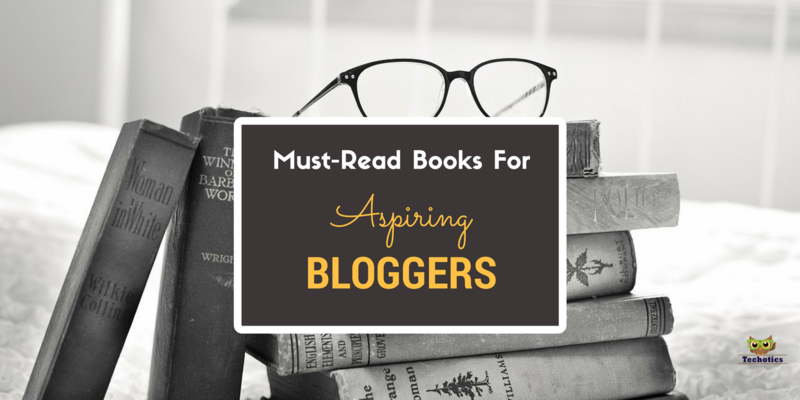 If you are totally new to the blogging world then this is the book you want to invest in! It will teach you everything from start till end on how to launch a blog to going full-time with it. Some of the topics that it covers are: choosing the right platform for the blog, designing your website, finding content, attracting your audience, financing it, managing ads, building a community and work-life balance while running a full-time blog. WordPress is the easiest way to setup and start a new blog and that is what this book is going to guide you through. Its a simple seven-step process that the author will guide you though from getting a domain, to registration and web hosting. It has contains a theme, ten plugins and four tools for building your audience. Following these step will get you up and running in just one hour! Isn’t that cool. Gary Vaynerchuk is well know as a personal branding and social media expert. This book is a mash up for both his books Crush It and The Thank You Economy with a fresh spin on the strategies. In this book he shares specific strategies of creating killer content to target based on the social media network you are targeting. It lays a beautiful blueprint of how to tell your story to get the right kind of attention from your audience. A resource which has insights about time-management, productivity and work-life balance contributed by dozens of thought-leaders, including Seth Godin, Gretchen Rubin, Steven Pressfield, Scott Belsky, Stefan Sagmeister, Tony Schwartz, Leo Babauta, Tina Seelig, Jonathan Fields, Teresa Amabile, Frans Johansson, and many more. Without a content creation strategy your blog cannot survive for long. This one-year editorial planner/calendar is like a business plan for your blog. The editorial planner comes with blank months. Before the month starts you jot down your plans on the first page so that you can plan your blog-goals accordingly. A page for you to track the progress of your goals. There are two pages for each month to brainstorm various content ideas for your blog. The book has a very strong message for those who want to change their lives for good. Pat shares his journey from being an ordinary architect to the superstar online entrepreneur who runs a successful business and blogs at smartpassiveincome.com. He shares all the challenges he faced in his life and portrays a strong and important message, about letting go in just few thousand words. If you are looking for motivation, this book is a must read! This is the dream of every blogger: quit their 9-to-5 day job and make a full-time career with their blog. Bob shares all the steps he took to make a living out of his blog and turing it into a full-time career in two-year period. He is the founded ChristianPF.com in 2007 and started full-time on it in 2008 after he was laid off. With these strategies he was able to make more than his day job within a year. You just launched your new blog, but what next? In this blog Dana shares a to-do list implementing on which she was able to drive traffic to her blog. It grew from zero to half million views each month. According to this book every who has a website is a publisher and any one who uses social media is a marketer, which indeed is true. So to survive in such a competitive world you need to stand out from the crowd. Ann Handley, gives expert guidance and actionable advice on how to create and publish killer content, how to market it and what steps should you take to make it stand out. Another great book which guide your through creating content that your audience will die for. It teaches you how to build a voice for your brand, how to leverage social media to spread it around social media using tools and boost your online presence so you get an engaging fan base that would love to communicate with you. If there is anything you need to know before starting a blog, then this is your solution. Its for all those newbies who are not sure where to start and what to blog about. It will guide you from choosing your blog niche and how to do market research to attracting your audience who will be ready to buy products or service you offer. With this book Gilbert, encourages its readers to uncover the jewels that we have kept hidden. Its an inspirational book that brings out the creativity which lies within everyone. This book depicts the psychological factors that make people visit specific kinds of blogs. It describes what factors motivate people to visit blogs like Information and knowledge, solutions to their problems, the way of interaction, entertainment, inspiration and motivation and so on and how to capitalize it. Social media is one of the most important form of marketing and if you ignore this channel you are losing a lot of audience. In this book Guy Kawasaki, the legendary former chief evangelist for Apple, teamed up with Peg shares hundreds of tips and tricks to build an impacting social media presence. By implementing these strategies you can optimize your social profile, build your brand, attract a larger fan base. Once you have read the book How to Start a Successful Blog in One Hour (listed on #2 in the blog) its time to take your blog to the next level. And that is what Scott writes about in this book. Once you content stops adding value to your readers, they will stop visiting your blog. He shares a 5-step action plan following which you will be able to publish great content. A book written by two brothers Tom and David, shows us that creativity is not just for few blessed ones. It’s within every one, all you need to know is how to unleash it. It falsifies the myth that to be creative, you need to be one of those “creative types”. They share the strategies and principles of creativity and innovation and they change the way we look at problems and how we approach them with a solution. Finding interesting topics that your audience would love reading is not easy. Infact its very stressful to come up with new topics every day. This book has blog topics for one whole year! Yes you heard it right, one whole year. And if you blog every other day, the topics will last for full 2 years! The only catch with this is, the topics in this book are only related to lifestyle blogging niche. Starting a blog may sound easy but keeping it active is what requires effort. But if you are passionate about what you do and are ready to learn and implement new things you will have a success running your blog. Following the advises from these though-leaders will prove really helpful. If you think I have missed any important and useful book on blogging feel free to comment on it down below and I will update my list.